On Saturday we laid around all morning being lazy. It was a perfect Saturday for it – cool and crisp with a cloudy mist. Saturday night we needed a quick but filling and warm dinner. We decided on Tomato Soup and Waffles. Which may sound like an odd combination, but it was perfect – and made me want to pair waffles with everything. 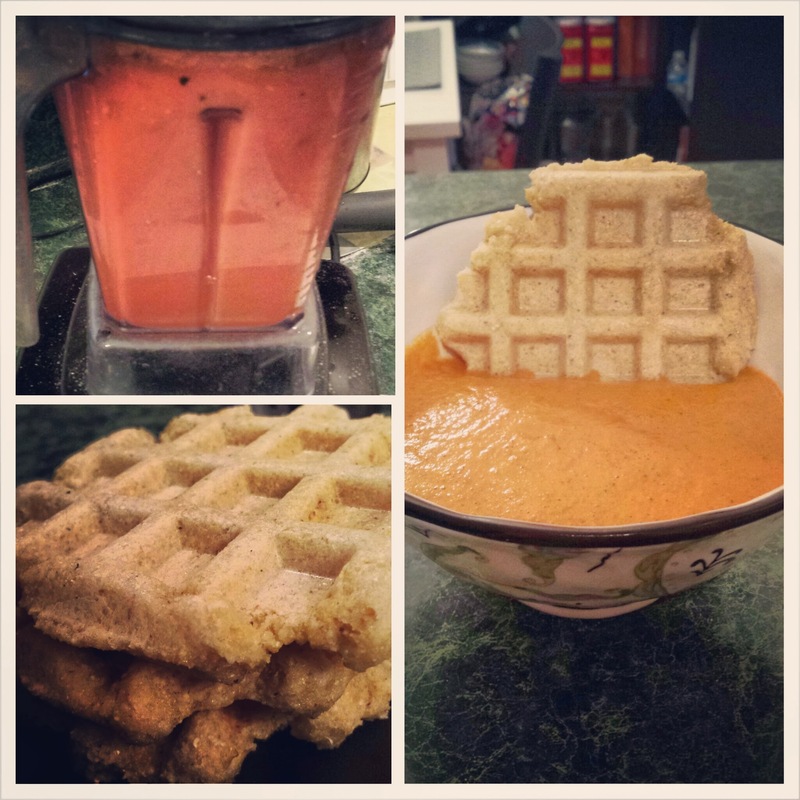 The little waffley-goodness grids are perfect for scooping up pockets of soup. And I can’t even imagine how amazing they’d be with chili! For the waffles we took the waffle recipe from a few weeks ago – Cornmeal waffles – and removed the maple syrup, vanilla, and spices. It left a perfectly crisp, ‘plain’ unsweetened waffle. Which was totally lovely for scooping up soup. For the soup, I loosely followed this recipe. But, when I make it again I will do about half of the lemon juice. It was far too lemony. I also added a good bit a paprika, to give it more of a kick. I didn’t have any sun dried tomato powder, so I just added the sun dried tomatoes into my blender when I blended the rest of the ingredients. In addition, I cut the tomatoes in half and broiled them until the skin shriveled (about 10 minutes) before blending them – to give the soup a richer taste. Otherwise, perfect. And even more perfect with waffle dunked all inside. (That’s what she said).